What does Wise View do for you? In our review of the Buddha’s Noble Eightfold Path we come to Wise View. Not at all. Wise View arises out of our own experience when we practice being present and compassionate as we go about our lives. 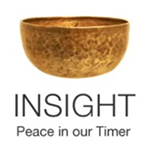 The insight that arises quite naturally is just what we need at the time and is framed in just the way that really speaks to us, because it draws from the pantry of our own life experiences. Of course, we can have a moment of recognition and clarity while reading or listening to a teacher or a poet. Their words may spark awareness and allow us to more ably identify the nature of the wisdom that is already within us, waiting to be noticed. But in a matter of minutes, hours or days we will most likely forget what the teacher or writer said. When you have your own insights on a retreat, they stay with you. At the end of the retreat, you might want to take the time to write down the exact wording that can at some point in the future help you in a moment of confusion. But you will be very unlikely to ever forget the experience itself. These moments are like shining jewels, rare, unexpected and treasured. Observing the mind at work, we see how thoughts, emotions and sensations pass through our experience, arising and falling away, often the same ones recurring again and again. We see that they are impermanent. Pleasant or unpleasant, misery or euphoria, this too shall pass. Aha! Observing the impermanent and unreliable nature of these thoughts, emotions and sensations, we begin to understand that they are not us, that they are just what happens at the conflux of chemistry and conditions to the human mind. Just as water passes through river beds and ocean floors and clouds, so too do these mental formations and physical sensations arise and fall away. (Of course the river beds, ocean floors and clouds are also ‘just passing through’.) Aha! Observing how we relate to our thoughts, emotions and sensations, how we cling to them or push them away, we see how we make ourselves unhappy, disappointed, miserable. Aha! Can you see the three universal truths within those three insights? In the first we learned about the nature of impermanence, anicca. In the second we got a glimpse of the nature of no separate self, anatta. And in the third we came face to face with dukkha, how we cause suffering. As we have insights, it can be useful to recognize how they fall into these three truths. It provides a comforting confirmation that our practice is indeed fruitful, helping us to maintain wise effort. So this is why we meditate, why we attend classes and retreats, why we create sangha, that wonderful community of practitioners and others who support us in our practice of meditation. We are not striving for better health or any of the things that turn out to be proven benefits of the practice, though we appreciate them. We give ourselves the gift of being present with compassion, so that we can see more clearly and have the vantage point of what the Buddha called Wise View. This entry was posted in http://schemas.google.com/blogger/2008/kind#post, insight, three characteristics, three marks, Wise View on February 1, 2015 by Stephanie Noble.